There's a huge interest in genetic research at the moment, particularly when scientists claim to find what genes govern specific traits. The future implications of scientific research into human genetics are mind-boggling, particularly in the field of health, and it is naturally a subject that all of us should be aware of, and, to some extent, knowledgeable about. This book, with its alluring cover and overtly presented academic credentials, provides both knowledge, wisdom and, intriguingly, a self-help guide. It argues that a new branch of genetic research, known as "epigenetics", can open the door to spiritual evolution. Epigenetics is the study of how environmental factors alter the expression of genes. The authors set out a foundation of understanding about epigenetics, and then provide us with "The Natural Happiness 28-Day Program" with which to improve our lives and find genetically-modified happiness. 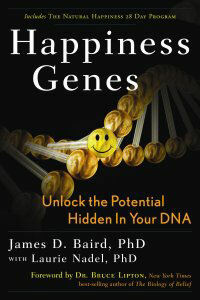 As a book reviewer sent a copy of 'Happiness Genes', my motivation for reading and enjoying this book may be different to someone who picks it up with the hope of self-improvement. My mind is tuned into the claims of the book, specifically on a scientific level, and not whether the book offers me the prospect of future happiness. To truly review the book's worth, it is clearly necessary for me to undergo the "28-day program" (which might indeed take quite a bit longer than 28 days, admit the authors). It's neither desirable nor practical for me to do so. In that sense, this cannot really be a proper review of the book! I think it is right to point out that any programme designed to improve one's general health and well-being should be judged upon its efficacy. The self-help programme discussed has evidently not been field-tested prior to publication. It might be too much to expect a double-blind clinical trial in an appendix, but some kind of analysis of the real benefits gained in practice would have been nice. The authors ask readers who undertake the programme to provide them with feedback and suggestions through their website, which could be construed as a way of obtaining data. But this is, by any standards, a rather unscientific basis to conduct a study! However, that is not to say that the programme would not actually work! I suspect that it might indeed promote benefits for some of the willing and motivated recipients of the method. The ideas put forward are realistic and health-promoting in a very general way - relaxation techniques; looking at ways to remove stress from one's life; improving relationships with others; finding peace within oneself. All good stuff! Also, as with any therapy, the client's belief in the efficacy of the therapy, and in the talent and authority of the practitioner, can have a huge impact upon the outcome. This book may provide such a therapeutic benefit by anchoring the psychologically-based programme of self-development to a new branch of scientific research. In other words, the new science is judged to validate the therapy, and therefore improves the outcome. So, happiness is largely derived from social interaction, and not insular individualism. Although the authors don't develop this further, it ties in with important academic studies by Christakis and Fowler on social networks, which found that, as a general rule, people with more friends and connections are happier and healthier (see reference below). Do our genes promote this sociability, or is society a system thrust upon us which moderates the expression of our genetic fabric through epigenetics? There is clearly a feedback loop going on here, and trying to unravel this is a hugely complex task. "Epigenetic changes are preserved when cells divide. Most epigenetic changes only occur within the course of one individual organism's lifetime, but, if a mutation in the DNA has been caused, some epigenetic changes are inherited from one generation to the next. This raises the question of whether or not epigenetic changes in an organism can alter the basic structure of its DNA, a form of Lamarckism." This is an important current debate in biological science. The authors of "Happiness Genes" argue that we have the power to re-write our own genetics. They show that our unconscious mind controls 95-99% of our behaviour, much of which found its development in the first six years of our lives. Thus, our subconscious programming was created by others, particularly our parents. We need to understand our unconscious processes and then take control of our actions consciously. This then provides the kind of re-programming that might, through epigenetics, alter the expression of our genes, and even provide the basis for positive evolutionary development. It's a remarkable proposition, and one that I personally have difficulty accepting. But as a concept it is certainly very exciting. Even if that does not prove to be true on any meaningful scale, I think that the general message in the self-help section of the book is correct. We need to individually review our addiction to materialism, find ways of removing stress from our lives (which is a contributory factor in illness), and learn to give a bit more to the people around us. "Happiness Genes" is full of wonderful insights, and is written in an engaging and supportive style. It does chop about a bit, as one might expect with dual authorship, but there are sections of the book I found very good indeed. The overview of our understanding of happiness within Psychology, and Appendix I (on genetics) were particularly good (hey, I'm a scientist!). There was also excellent advice about meditation techniques. I lost the plot a bit about the spiritual genes, but I know that others will gain much from those sections. As self-help books go, "Happiness Genes" is informative and thought-provoking. It might even offer a method to enhance positive evolutionary development - and who can argue with that? Subtitled "Unlock the Positive Potential Hidden in Your DNA"